Red, White, and Blue – 4th of July Venison Burgers! In celebration of the 4th of July, try this “Red, White, and Blue” burger…sure to be a crowd pleaser. The “red” is from sun dried tomatoes, the “blue” is blue cheese and the “white” is white tailed deer. Hopefully you have some ground venison in your freezer, but if not, you can get some from a local butcher or substitute with grass-fed beef. Recipe was developed by Cagey T.
Mix all ingredients and form into 6 hamburger patties. Grill patties until cooked through. 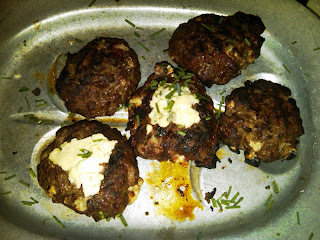 You can top patties with additional blue cheese and chives. It is important to not over cook venison or it will dry out due to it’s lack of fat, which also makes it a healthy choice of meat! Serves 6. I'm happy to see that "Cagey" stuck. Yes, it is very fitting!